Finding suitable paints for old buildings can be harder than it sounds and using the wrong products can not only damage the building but also the environment and your health. Damp is a common problem in old buildings and it has been thought for many years that the only way to try and combat it is to waterproof the building via impermeable coatings and injection damp proof courses. Although this offers a temporary barrier to water penetration unfortunately it is not that simple and in the longer term they often end up compounding the problem. One of the main causes of failure is that buildings can go through significant movements, both structural and thermal. which often results in the waterproof coating cracking. Once a crack has appeared water can penetrate in through, and is held captive within the wall behind the coating, because it cannot evaporate out through the crack anywhere nearly as quickly as it is drawn in. This then means that the water level in the wall builds up further and further over time. Finally the water pressure behind the waterproof barrier becomes too great and it pushes the layer off the wall. This is often seen where you have paints that are ‘blistering’ off, or cement renders that are forced off the wall (cement renders are also largely impermeable). The water that is held captive in the wall can also lead to serious deterioration of the building fabric (please see picture below). 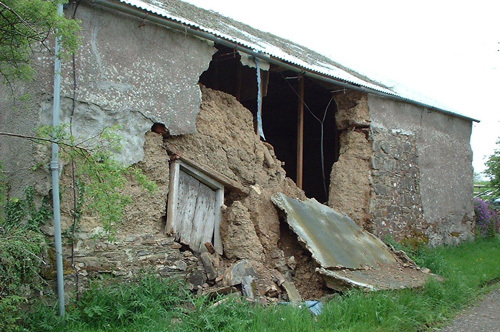 This is an example of a traditional cob barn that has been covered with a cement render that had low breathability. When render was compromised the cob became saturated which resulted in the failure of the whole structure. This has led to more and more people becoming aware of the importance of breathable materials for older buildings. Unfortunately ‘breathability’ is one of those terms that has become widely used but poorly understood. In effect it means the ability of a material to allow free movement of water vapour through its structure, in this instance allowing water within walls to evaporate out. Paints have been an important part of human life since the very beginnings of civilization with cave paintings being used for education and decoration as long as 40,000 years ago. Since the development of sophisticated construction techniques, such as the use of lime in the last 6000 years, paint has also been used to try and protect and preserve these buildings. The most widely used paints up until the 20th century were limewashes. The basic limewash is a superb material and protected many of the important historic buildings that we still appreciate across the country today. 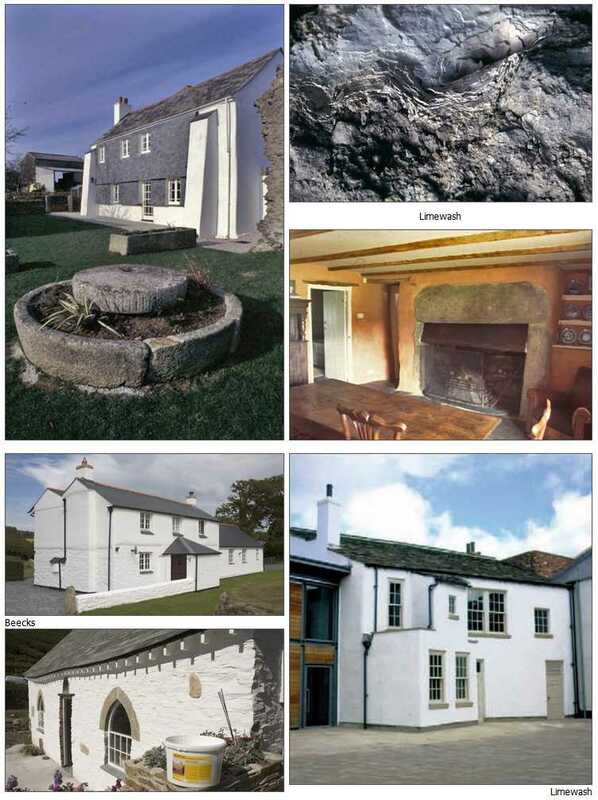 Limewash consists of limestone that has been burnt in a kiln (you may have noted the amount of lime kilns around our Cornish coast), which is known as quicklime, and water. When this is applied to a porous wall it soaks in, absorbs CO2 and reverts back to limestone. It is this simplicity and the readily available sources of limestone that made it such a widespread form of decoration. Typically it is white in colour but natural earth pigments were also used on occasion to give these paints attractive colours. These coatings offered good protection to buildings but required regular maintenance because they worked by being a sacrificial layer to the building. This is how paints should work because it is a lot cheaper to redecorate than to rebuild! However one of the main drawbacks of limewash is durability. You cannot scrub them clean because limestone is soluble and ends up rubbing off and in exposed spots external facades needed annual redecoration. 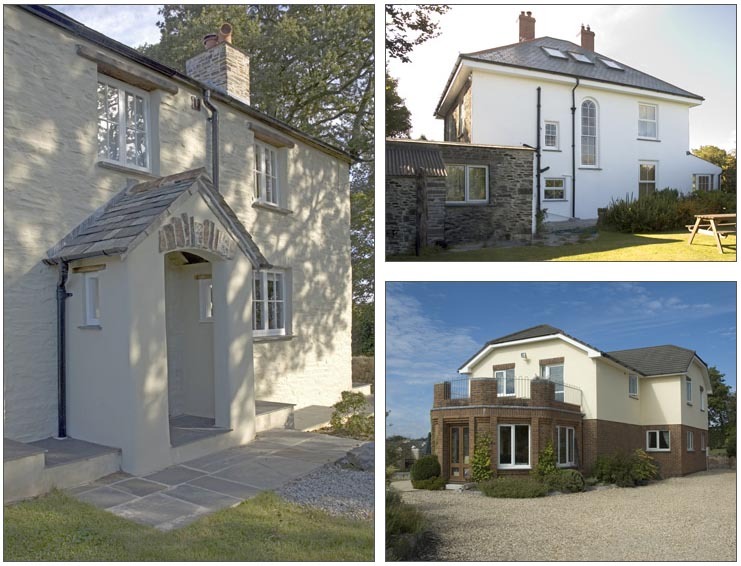 Also on new render you need to do at least 5 coats to achieve good coverage due to its thin nature. These durability and coverage issues led to many different additives being used to try and improve the performance of these early paints and I will cover the 2 types that became widely used. Casein paints are also sometimes known as milk paints because the additive Caseinite is actually extracted from milk. It is effectively the solid part of milk and can be extracted with dilute acid. 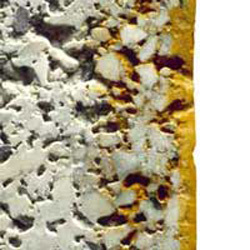 It was discovered that by adding Caseinite to limewash it offered superior durability. This was because the mixture produced Calcium Caseinite which has an insoluble bond. It can be applied to the inside and outside of buildings but is particularly popular for interior use as it adheres better and can therefore be cleaned more easily. It was also found that the addition meant that it produced a thicker paint and hence covered in fewer coats. Tallow is an animal fat that was added to limewashes to increase the weather protection capabilities. Unfortunately this meant that the breathability was also reduced, although it is still a lot better than most present day petrochemical paints. This drawback meant that it was only really used as an external coating. 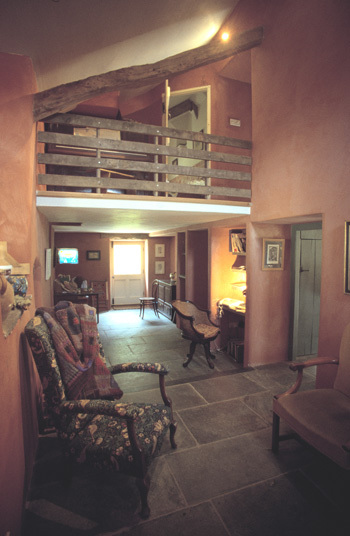 Another similar addition to limewash was linseed oil. This resulted in similar characteristics. Distempers are slightly different in that often the lime was not the binder and they in fact used chalk or milled lime (that had not been burnt) as a filler and for the white colouring. The binder that was used as glue, traditionally it was often rabbit glues that were used because of its abundant availability. Distemper is generally used on sound plaster, wallpaper or previously painted inside surfaces. It is easily marked and therefore tends to be favoured for use on ceilings and wallpaper but it is certainly not advised for high traffic areas. The use of glue binder meant that these paints could be used on any background, unlike limewash that can only bind on to lime based materials (porous backgrounds). Oil bound distempers were also developed from these paints to try and offer better durability; again it was similar materials that were commonly used such as linseed and tallow. These became very popular in the mid 19th century and with their film forming nature were very much a precursor to the modern vinyl and acrylic paints that finally superceded them after two world wars. At the end of the 19th century silicate paint systems were developed in Germany. As with limewashes, mineral silicate paints soak into the background and bond to it. Where they differ is that limewashes generally bond to the calcium in the background, whereas these mineral paints form a strong chemical bond with the silica sand in the stone or render. It is well known what a strong, stable element silica is and it has been widely used in building due to these attributes (for example; glass, silica sand and aggregate). The resultant decorated facade still has an active pore structure and hence retains a breathability equivalent to that of limewash. The big advantage is that it lasts a lot longer and there are examples in Germany and Switzerland of mineral silicate paints on lime based renders lasting over 100 years (Source: Traditional Paints, Colin Mitchell Rose, 2004).This meant that they quickly replaced limewashes where they were easily available. Traditionally these paint systems cam in two components, a potash waterglass (liquid Potassium and Quartz) and powdered mineral pigment. These had to be mixed on site and applied within three days of mixing otherwise reactions between the two components resulted in the paint going hard in the tub. More recently companies have striven to produce a simple one component mineral silicate paint. This was achieved by adding a small amount of acrylics (has to be less than 5% to be classed as a mineral paint) to the paint, which stopped the paint setting hard in a wet state. These additions have led to some modern mineral silicate paints being film forming rather than forming active silica bonds with the wall in the traditional sense. The easiest way to check if a mineral paint is working as it should is with paint stripper, a film forming paint will be easily stripped, whereas an active mineral paint will never be removed! Another recent improvement has been the addition of waterproofers which has meant that you can now offer a barrier to water entering a wall - but if that is breached then it is still fully breathable and therefore can still let that water escape. This is obviously a huge area to cover and to keep things simple I am only going to concentrate on synthetic resin dispersion paints as these are the most common type of wall paints at present. Since the mid 20th century petrochemical paints have dominated the market. This is because it was found that you could produce polymers by combining monomers from the fractional distillation of crude oil (other gases are also added to produce polymers). Some polymers that were discovered are very good binders and are also water soluble. This meant that water based paints could be produced with the addition of pigments for colour. They could be applied to any kind of surface (apart from glass), they were cheap to produce, and with the building boom after the war, it was easy to see how traditional paints were quickly replaced. However more recently after fifty years of widespread use, the problems associated with these modern coatings have become all too apparent. Firstly synthetic resin dispersion paints are film forming and therefore are less open pored and less breathable (discussed in more detail below). This creates a number of problems, there is the huge issue of damp accumulation within walls behind these paints, also you are more likely to see condensation problems on internal walls and the associated fungal algal growth. Generally artificial resins have thermal expansion coefficients ranging from ten to twenty times higher than that of the underlying mineral surface to which they are applied. This results in differential thermal movements which can lead to cracks appearing and even substantial coating failure. Depending on the exact formulation, synthetic resin dispersion paints will emit solvents, plasticizers, residual monomers and other Volatile Organic Compounds (VOC’s), which are carcinogenic, for years after application. This has been well documented in recent years with the World Health Organisation classifying painting and decorating as a carcinogenic profession with a 40% increased chance of contracting lung cancer. 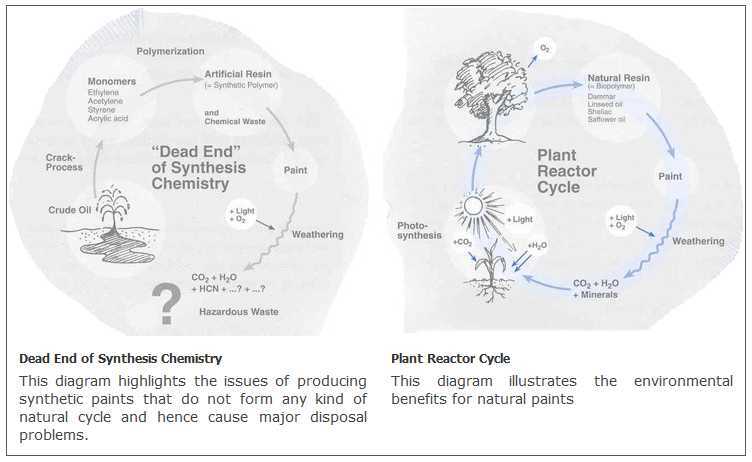 There are also serious environmental implications with the vast amount of energy used in modern paint production as well as the associated toxic waste by products. Throughout this paper I have looked at various paints and how they work. When it comes to their suitability for old buildings the main factor to consider is the ability of the paint to allow water to escape out of the wall, because it is almost impossible to stop the ingress of water into a wall permanently. Generally materials display better breathability when they have a good pore structure. That is to say those materials that are honeycombed and low density are more breathable. When looking at the performance of paints it is important to understand the two main ways in which paints work. They can either soak in to the underlying material and bond to it, or they can form a discreet layer or skin, that is stuck to the surface. This has a big impact on the pore structure of the decoration. Paints that stick to the wall as a discreet layer are generally based on organic polymers that are petrochemical in origin and tend to have much lower permeability due to a very limited pore structure. The addition of inorganic fillers has been used to promote the formation of a better pore structure within these paints and is the basis of modern microporous’ coatings. Paints that work by soaking in to the underlying material on the other hand, tend to take on the pore structure of that given material and hence are often considered as macroporous’ (however this is obviously directly related to the porosity of the material being painted). The importance of breathability has meant that it has become a term that is used as a marketing aid and is often banded about without ever being quantified. The most useful measure of breathability that I have found is the Sd value. This is a measure of a material’s resistance to the transmission of water vapour through it. The units of the Sd value of a material are given in metres and it refers to the resistance shown by the equivalent thickness of air, so the lower the number the better the breathability For example limewash has a Sd value of 0.02m which means that it offers the same resistance to water vapour migration as 2cm of air - whereas typical microporous paints have a Sd value of around 0.5m or 50cm of air. As you can see this is a huge comparative difference and from my experience paints that have a Sd value of < 0.1m are adequately breathable to cope with most settings, however within very exposed places with severe damp I would recommend < 0.05m Sd. When decorating an old building please think of the performance of the paint before the colour it is to be painted. Always ask for some kind of quantifiable evidence of breathability, most paints are breathable to some extent but that is not to say that they will be able to adequately manage damp walls. It is a lot easier to repaint a building than have to rebuild it! Also be aware that most of the expense of decorating is the application so if you can find a durable paint that is slightly more expensive it will be a lot cheaper in the long run than using an inferior paint that has to be applied more frequently.